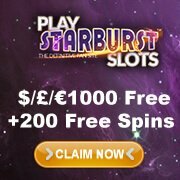 Starburst slots game is one of the hottest A-listers to adorn the world of online gaming. The 5-reel, 3-row game features tremendous winning opportunities along with a promise to deliver unforgettable gameplay through its eye-catching themes and indulging gameplay. Despite knowing that the game takes on some easy mechanics, you can actually get an even easier hang of the game when you read this Starburst slots guide. This Starburst slots guide will walk you through the rules, ins and outs, and other key elements you ought to know before you play Starburst slots. It always pays to know the game mechanics first before playing in any Starburst slots casino. So here on this Starburst slots guide, you will see how you should generally go about the game. Players are allowed to play 1 to 10 bet lines at different bet levels and coin values. The spin button engages the round at the current bet lines, bet level, and coin value. The MAX BET option sets the maximum bet lines, highest bet level, and current coin value. AUTOPLAY automatically plays the game for a predetermined number of rounds set by the player. The PAYTABLE displays winning combinations and payouts. COINS display the number of credits the player has available to wager. Bet level is the number of coins per bet line. Bet line win in coins is equal to the value shown on the pay table multiplied by the bet level. A bet line win in currency is equivalent to the win in coins multiplied by the coin value. Starburst Wild symbols substitute for all symbols. Only the highest winning combination on an active bet line from left to right or right to left is paid. Coming with up to three Starburst slots free spins, the game’s expanding wild symbols are what you will want to chance upon. Help yourself by reading this part of the Starburst slots guide which talk about how these icons can do the trick to win. The Starburst Wild symbols are only available for reels 2, 3, and 4. One or more Wild symbols appearing on any of the three eligible reels activate the Starburst Wild feature. During the Starburst Wild feature, the Starburst Wilds expand to cover the entire reel and remain in place while the other reels re-spin. If another Starburst Wild appears during a re-spin, it holds in place together with the previously expanded Wilds for another re-spin. The Starburst Wild feature ends when no Wilds appear during a re-spin. Up to 2 additional Starburst Wild symbols can appear after a Wild engages a re-spin; triggering 1 added re-spin for each appearing Wild symbol, for a maximum of 3 re-spins. Also here on this Starburst slots guide is the set of game setting options that may optimize your gaming according to your liking. Now be familiar with the following functions to suit your game play specifications. The Spanner icon in the game panel gives players access to the game’s settings. Quick Spin. Turns the Quick spin option on or off. Turn the animations on or off. Game history. View latest game history.